• Announced his intention to close the detention facility at Guantanamo Bay (2009) * Note: The closure has been delayed due to massive opposition but it remains on the agenda. • Instituted a new Nuclear Posture Review, revising US nuclear deterrence policy to encourage more nations to join the 1996 Comprehensive Test Ban Treaty (2010) * Note: Components of the policy include: a pledge to stop nuclear testing; a pledge to not build a new generation of nucs; identifying nuclear terrorism, rather than a launch from another nuclear state, as the major threat; a pledge to not use nucs on a non-nuclear state in a conventional conflict; etc. • Beginning the process of reforming and restructuring the military to a post-Cold War, modern fighting force (2009) * Note: Bush announced in 2001 his intention to do this but backed off the reforms after 9/11, which include: new procurement policies; increasing the size of Special Ops units; deploying new technologies; creating new cyber security units; etc. • Signed bill providing assistance for caregivers of veterans wounded in Iraq and Afghanistan (2010) * Note: The omnibus bill does the following: Training, funding, and counseling for caregivers; promoting pilot childcare programs for women vets under treatment at the VA; independent oversight to prevent abuse; readjustment counseling for National Guard and reservist units; etc. • Established a new interagency task force to assist veterans owning small businesses (2010) * Note: The efforts include promoting federal contract opportunities, improve access to loans and capital, mentor assistance programs, etc. • Signed the HIRE Act to stimulate the economic recovery (2010) * Note: The bill includes: tax cuts for small businesses who hire someone unemployed for at least two months; small businesses can write off their investments in equipment this year; etc. - Joint aid and relief planning with the U.K.
...And A FAMILY MAN ! B4B NOTE: Special Thanks to Robert P. Watson, Ph. D., Professor of American Studies, Lynn University who compiled this list and writes " Like all presidents, Barack Obama has made mistakes. But, as a presidential historian, I have been struck by claims being put forward by Obama’s many critics and the news media that he has accomplished little when, in fact, his presidency is easily one of the most active in history." And Thanks to our friend Sherry Lou Meeks. Thank You Mr. President ! 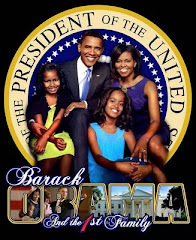 Welcome to the new segment of Greg Jones' Blacks4Barack.org. Here you'll find more news you may find interesting. Be Inspired...Be INFORMED... Be Involved !!! And always remember....People Power WORKS ! YOU Make A Difference...Be INVOLVED ! A Multi-Racial, Net/Grassroots Organization...Dedicated To TRUTH ! People Power WORKS !